Filed under: Crocus, Price Reductions. 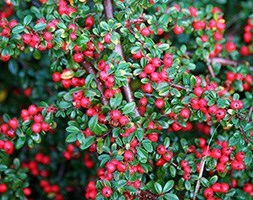 Position: full sun or partial shade Soil: moderately fertile, well-drained soil Rate of growth: average to fast-growing Flowering period: May Hardiness: fully hardy The glossy dark green leaves of this small, spreading, deciduous shrub are studded with tiny, pinkish-white flowers in May, followed by bright red autumn berries. The leaves turn orange-red before they fall. The branches form a pretty herringbone pattern, which means the plant looks stunning grown flat against a wall. It is also an excellent groundcover plant for a sunny border. Garden care: After flowering, lightly cut back any branches that spoil the symmetry of the plant and apply a generous 5-7cm (2-3in) mulch of well-rotted garden compost or manure around the base of the plant. In autumn trim back lightly any branches that obscure the display of fruit. Daffodils add bright colour and a sense of spring to your home and garden. 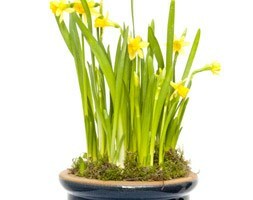 In this gift set, we have potted up 7 bulbs of Narcissus tete a tete (one of the most popular dwarf daffs, with clusters of up to three deep golden-yellow flowers on each stem) into a glazed ceramic pot. They are sent out dressed with moss, as well-rooted plants, but they will need growing on before they start to flower. They will then go on to provide several weeks of colour. After they have finished flowering, the bulbs can be planted in the garden, where they will appear year after year. Make sure your gift arrives looking really fabulous by adding giftwrap in the checkout. Pot measures: 18cm tall x 17cm wide. Each terracotta pot has been potted up with 10 Galanthus nivalis (snowdrop) bulbs, before being dressed with moss. 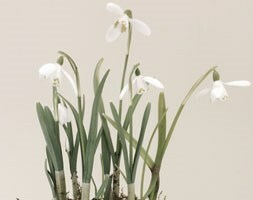 Snowdrops are universally loved for the colour they bring to the garden in winter. The bulbs are well rooted, but may not be in flower when they are sent out, so you may have the enjoyment of watching them grow. After they have finished flowering, they can be planted outside in the garden and allowed to grow on, where they will slowly form naturalised clumps. They are sent out as Make sure your gift arrives looking really fabulous by adding giftwrap in the checkout. Pot measures: 9.5cm tall x 11cm wide. Position: full sun or partial shade Soil: well-drained soil Rate of growth: slow to average Flowering period: April and May Hardiness: fully hardy This dwarf, deciduous shrub has two seasons of interest. In mid-spring, red-tinted, pale yellow flowers appear and in autumn, the small, purple, spiky leaves turn a dazzling shade of red. It’s size and the fact that it requires little attention means it is an ideal choice for a small garden, and it also makes an attractive, low informal hedge for a sunny or partially shady site. Garden care: Requires minimal pruning. Where some pruning is required, cut back in autumn or winter, after the appearance of the autumn fruits. 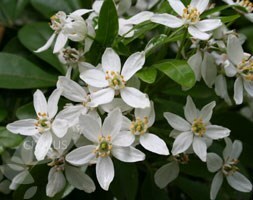 Position: full sun to partial shade Soil: fertile, well-drained soil Rate of growth: fast-growing Flowering Period: May, often with a second flush in late summer or autumn Hardiness: fully hardy Wonderfully scented, star-shaped, white flowers appear in late spring among glossy, aromatic, dark green leaves. This handsome, compact and easy-to-grow shrub is a valuable garden mainstay for a protected site in sun or part shade, although in shade it may not flower. The glossy, evergreen leaves provide an excellent backdrop for medium-sized perennials and pale-grey or purple foliage plants. Garden care: Prune established plants in spring immediately after flowering, removing 25-30cm (10-12in) of the flowered stems. 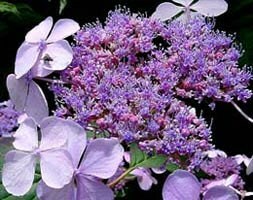 This encourages a second flush of flowers in late-summer and autumn. At the same time, remove any frost-damaged stems to the base. Position: full sun or partial shade Soil: moist, well-drained, moderately fertile, humus-rich soil Rate of growth: average Flowering period: June to September Hardiness: fully hardy Flattened heads of beautiful, blue-mauve flowers last from June to September and in autumn, the pointed, mid-green leaves, turn dusky red. On alkaline soils th e flowers may become pink. This compact, deciduous hydrangea is perfect for small gardens in sun or partial shade. Hydrangeas give their best blue flowers on acidic soils with a pH 5.5. When grown on neutral soil, (with a pH of 7), the flowers will predominantly be pink, although you may also get blue or mauve blooms. If you want to make sure that your Hydrangea has blue-toned flowers, you will need to make sure your pH does not creep above 6.5. To lower the pH on a neutral soil, you can treat it annually with aluminium salts. It’s much harder however to alter the pH of limey (alkaline) soil, so it’s much easier to grow white or pink hydrangeas instead. Garden care: Hydrangeas do not like to dry out. In dry weather, soak the roots with a hose and the plant will usually recover. 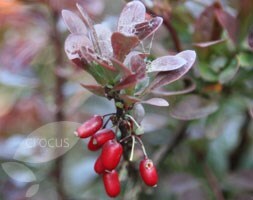 Remove faded flowerh eads in spring after the danger of frosts, cutting back the flowered stems to a strong pair of buds. Take out misplaced or diseased shoots. Mulch young plant s with a well-rotted manure or compost in spring. Once established, remove a quarter to a third of the shoots to the base of the plant. 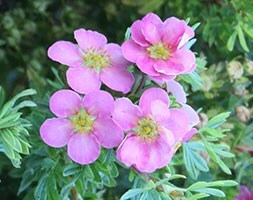 Position: full sun Soil: poor to moderately fertile, well-drained soil Rate of growth: average Flowering period: May to October Hardiness: fully hardy Masses of pretty pink flowers smother this deciduous, shrubby cinquefoil from late spring to mid-autumn. The small dark green leaves form dense mounds, which makes it useful for informal hedging, or for adding structure to a mixed or herbaceous border. 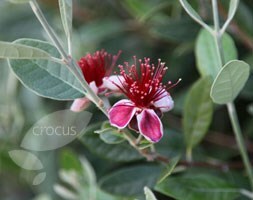 This is a fabulous, long flowering shrub, which will thrive in a hot, sunny position. Garden care: Trim lightly after flowering, cutting the older stems to the base and removing weak, spindly growth. Apply a generous 5-7cm (2-3in) mulch of well-rotted compost or manure around the base of the plant in spring. Position: full sun or partial shade Soil: prefers moist, well-drained, acidic soil or ericaceous compost in a pot. 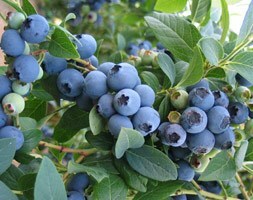 Rate of growth: fast-growing Other features: light blue berries (July) Hardiness: fully hardy Considered by many to be one of the most reliable croppers, this mid-season cultivar produces high yields of large, delicious fruits that are ready to pick in mid-summer. The vigorous bushes have an upright habit and show a good resistance to disease. Garden care: Prepare the ground well before planting. Blueberries can also be grown in large pots and containers if ericaceous compost is used. Prune in winter, cutting out dead or damaged branches. In spring, feed with sulphate of ammonia, sulphate of potash and bonemeal and top-dress with ericaceous compost. Position: full sun Soil: light, well-drained soil (or a loam-base potting compost such as John Innes no. 3 for container-grown specimens) Rate of growth: average Flowering period: July Flower colour: purple-red Other features: in warm areas the flowers are followed by edible red-tinged green fruit Hardiness: frost hardy (needs winter protection) An exotic-looking evergreen shrub producing attractive, purple- red flowers with long, red stamens in mid-summer and grey- green leaves, white-woolly beneath. This pineapple guava copes well with drought and salt-laden air making it a valuable specimen or hedging plant for a sheltered, sunny, coastal garden. In areas where temperatures fall below 5°C to guarantee a crop of edible fruit it’s best grown under glass in a cool greenhouse. Garden care: During the growing season water container-grown specimens regularly, applying a balanced liquid fertiliser every 4 weeks. Water sparingly in winter.